Another birthday, another friend tranformed. 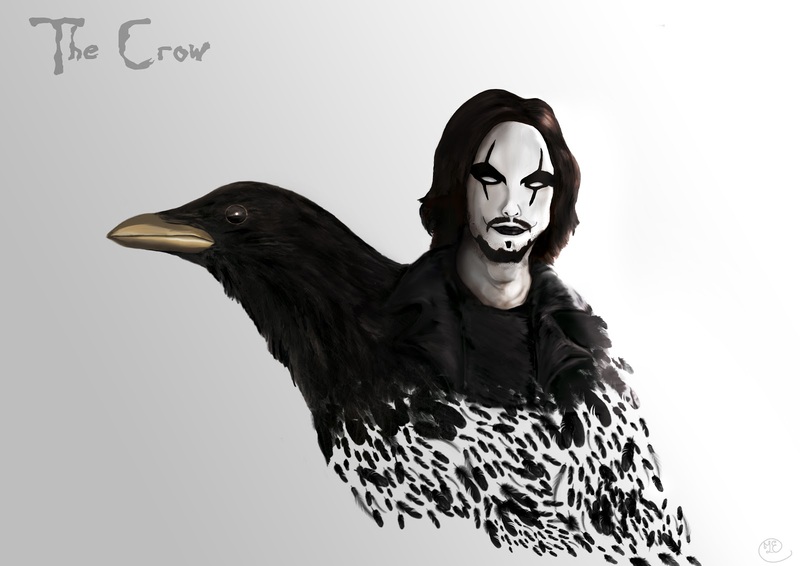 And 'çause it's also Halloween and I was watching "The Crow",( the first one), I've decided to transform that friend into The Crow with a bit of a surrealistic feel to it. A bit of backstry: The Crow was a comicbook about a murdered musician, Eric Draven comic back to life with the help of a supernatural crow to take vengeance on the tugs who murdered his girlfriend. The Crow was then filmed, with Brandon Lee in the lead role as Eric Draven. It was also his last role,as he died a tragic death. In one scene the group of thugs shoot Eric, but the bullets used in this scense weren't blanks. A veru tragic end to a legend. Also a shout out for Sunmoondragoness for helping me out with tips! Chek her blog at: http://creationsofeve.blogspot.nl/ and her deviantart page: http://sunmoondragoness.deviantart.com/.